Welcome back to all of you who have played our challenges before and a big welcome to those who are stopping by for the first time! I hope you have great fun playing along! Fathe's day is on June 19th this year, so I thought I should dedicate this challenge to all those awesome fathers who make our lives so very comfortable!! 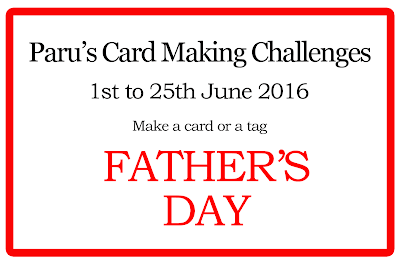 The challenge for June is..
Take a photo and link it up below. 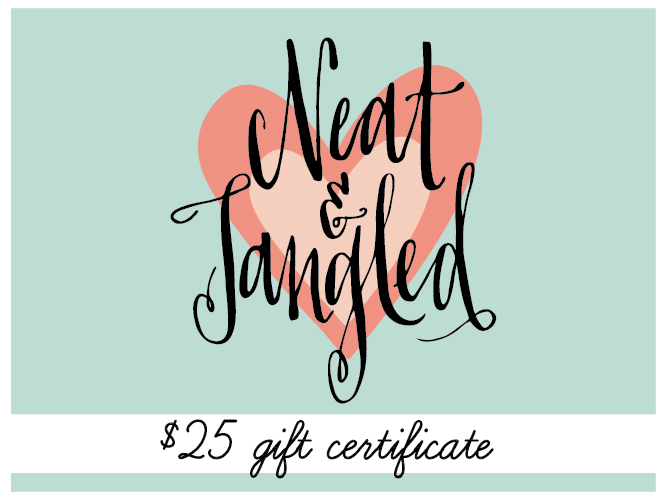 Link your blogpost/social media post to the linky below. 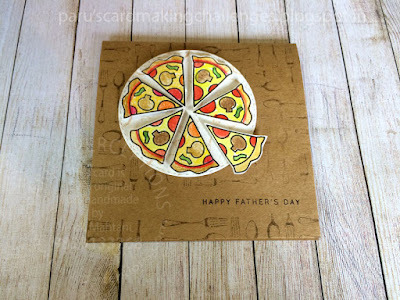 I made this card for my pizza loving husband!! Sunday dinner is usually pizza night...an activity which my husband and teenage son have fun sharing...they usually argue about the pizzas though!! When I was looking through my stamps, I thought this stamp from the PaperSmooches 'Think Fast " stamp set was perfect for the occasion! For the background, I used the cutlery background cling stamp from Hero Arts. 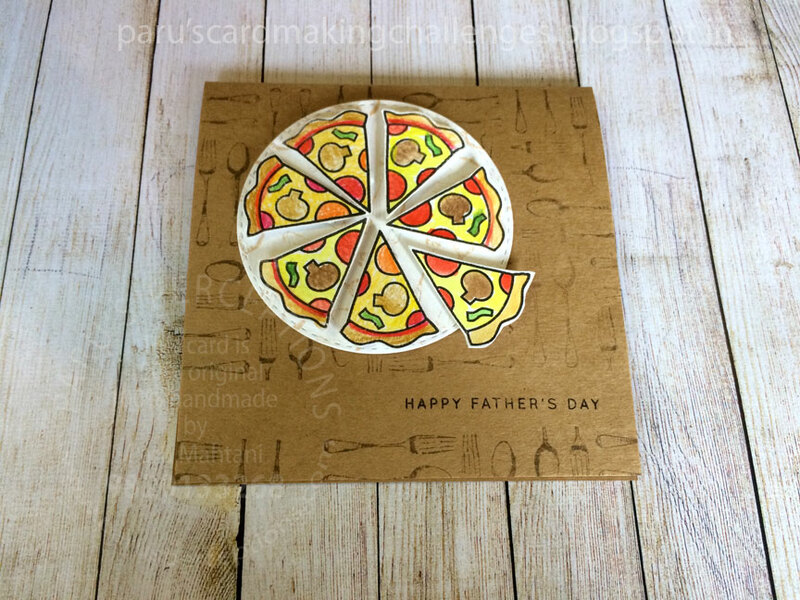 The sentiment stamp is from Simon Says Stamps Fathers' Day stamp set. 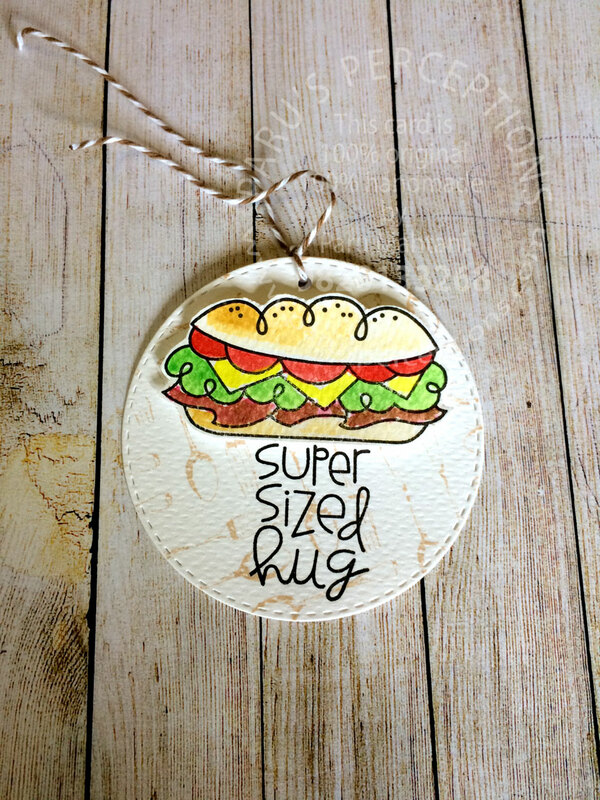 I used two stamps from the same Paper smooches stamp set as well as the same background stamp as above for this tag! I cut the circle using Simon Says Stamp stitched circles and punched a hole to add the bakes twine to finish the tag. All images are watercoloured using Sakura Koi watercolours, fussy cut and popped up with 3D foam tape to add dimention and interest. I hope I have inspired you to think outside the box on this theme! What can I say about her that you don't already know!!!! She is the queen of card making! I am so honoured that she is my guest designer for this month!!!! Here's what she has to say about herself! I'm blessed with two wonderful adult children and a loving and supportive husband. In my little world,I love creating cards, traveling and making yummy food. I am currently on Simon Says Stamp Wednesday Challenge DT. I am the founder/host of Virginia's View Challenge. I discovered stamping nearly 20 years ago and has been fascinated by it. I have entered countless challenges and contests, with many failures. But no matter how good I feel about each card, I strive to make the next one better! Being passionate about trying new techniques that intrigue, I love to share ideas and creations in my blog. I truly appreciate the fellow card-maker/bloggers' positive feedback and I hope to encourage other fellow card-makers as much as I can. Thank you, Paru, for inviting me to be your guest design for June! I stamped the Hero Arts Goldfish in Distress Inks (Carved Pumpkin and Festive Berries) with the help of MISTI. 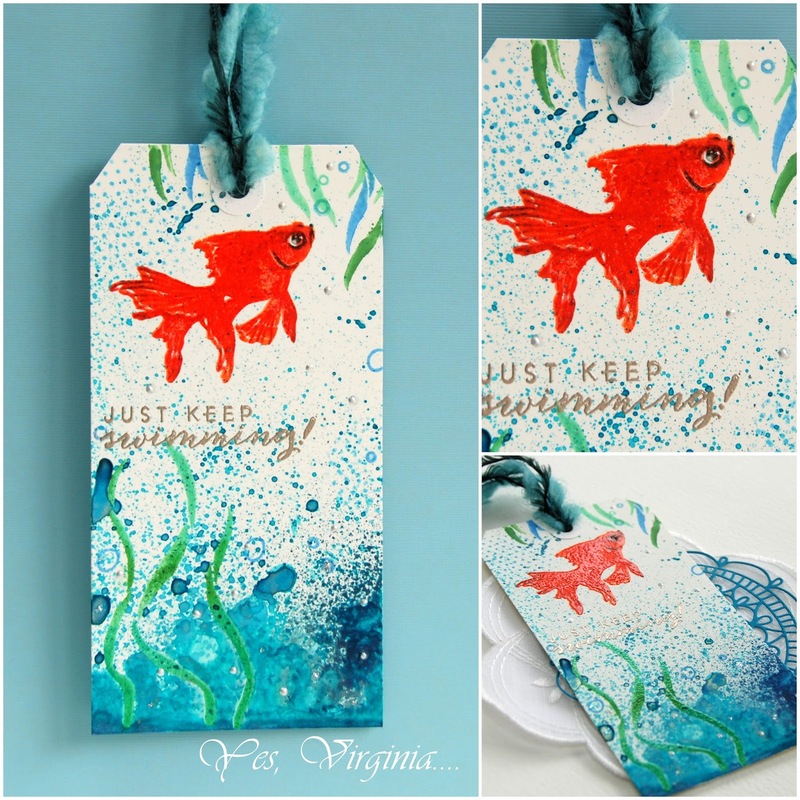 After stamping the image, I clear-embossed the fish. I did the same with the sea weed/grass in Mowed Lawn Distress Ink and Scuba (Simon Says Stamp). After that, I sprayed blue mist ( Lindy's Gang Steel Shimmer Glitz Spritz and Heidi Swapp Project Life Spritz). Once the paint dried, I embossed the sentiment with Hero Arts Platinum EP. I added the droplets with Per White Opel Liquid Pearls. I added the adornment/twines for the tag. The tag is for my son who is leaving for an Engineering internship in San Francisco ( I live in Canada) tomorrow! Oh boy, I am gonna really miss him! As always, we have some fabulous sponsors lined up for this month. 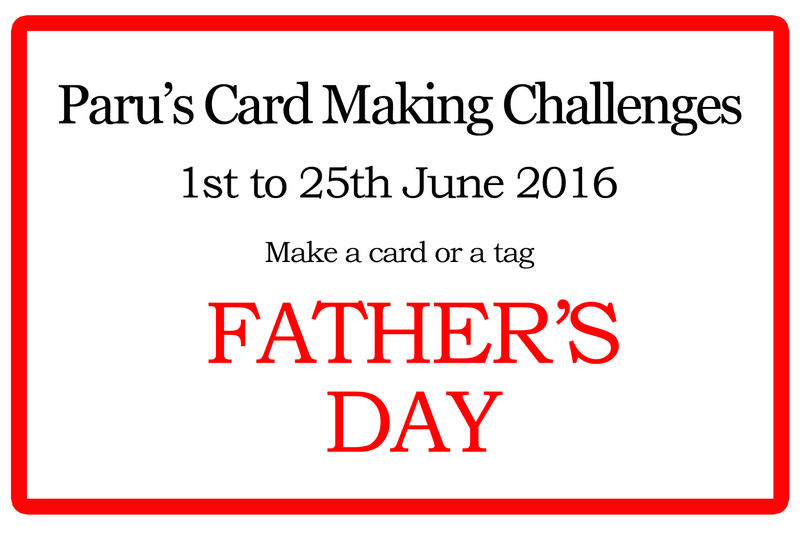 I hope that we have inspired you to bring out your thoughts for Father's Day! This challenge will run from the 1st of May till the 25th of June. as I will be travelling in the second half of June. You can link up your creations below. Hello Paru~I just discovered your blog through Virginia and WOW! What a warm, inviting, fabulous place you've designed for us to come to play! 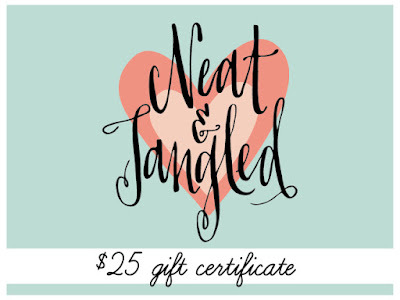 Virginia's card and tag are such fun, and yours, absolutely delicious! My husband and I make homemade pizzas on Saturday night (I make the dough; he does all the fancy stuff *grin*); my favourite meal of the week! I've added your challenge to my Feedly list so I don't miss a single thing; fingers crossed I can play along! Inspired!! Thanks for the opportunity to join in the fun, Paru! Paru, thanks for inviting me to participate in this month's challenge. Love the inspiration on this blog.